Who wouldn't want to build a minifig fort from a set of concrete blocks made to look like Legos? These must-have blocks for Lego fans were created by Etsy seller Tara Ketchum (studio 1015). Each one is the size and shape of a standard Lego brick. 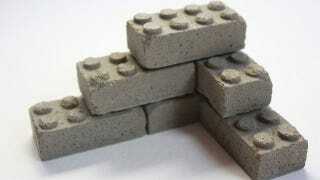 They can be used to build structures that need an authentic concrete touch or given as a gift to a die-hard Lego fan.